The modern enterprise’s path to success is paved with the real-time insights that it derives from in-memory analytics. Organizations that outperform and outpace their competitors know what sets their products or services apart because of the quantity, quality, and relevance of their business intelligence (BI). Good BI relies on data centers that can process data-intensive workloads—like enterprise... resource planning (ERP), supply-chain management (SCM), online transaction processing (OLTP), online analytical processing (OLAP), and data warehousing—in-memory for rapid analysis. Because they rely so heavily on hardware, traditional data-center solutions often struggle to keep up with modern data sets—it can be highly cost-prohibitive and time-prohibitive to update or upgrade hardware. Cloud-based databases have alleviated some of this strain, and they can lessen a data center’s reliance on hardware, but virtualized databases are only as capable as the hardware that supports them. 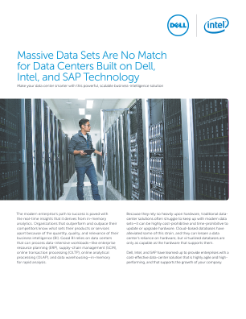 Dell, Intel, and SAP have teamed up to provide enterprises with a cost-effective data-center solution that is highly agile and high-performing, and that supports the growth of your company.